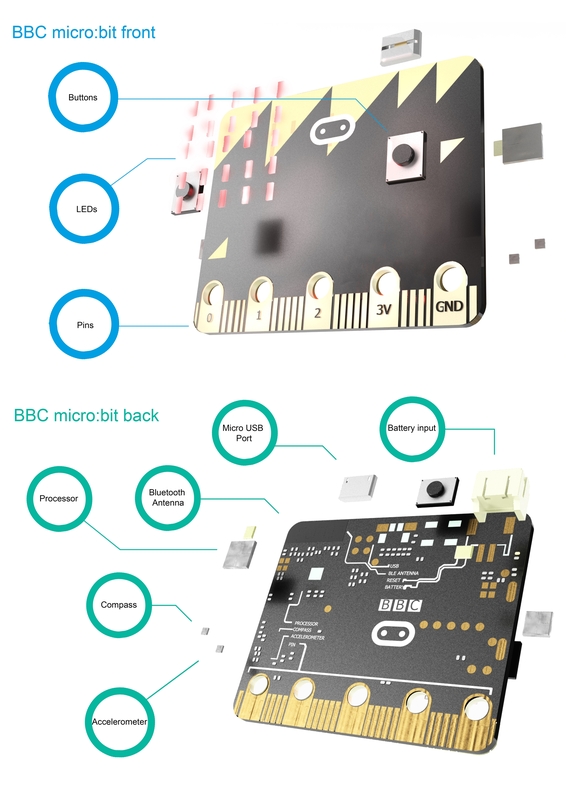 This Kitronik University resource is part of the BBC micro:bit partnership and features FREE downloadable CAD files in relation to the BBC micro:bit. These downloadable files are available in three different formats and have been made using Autodesk’s Inventor Professional. The team here at Kitronik have created a CAD model of the BBC micro:bit. We will be using this model to produce many of the resources we will be creating for the BBC micro:bit. We’re sure these models will be useful for lots of applications so we are making them available completely free of charge, as we feel this maintains the spirit of what the BBC are trying to achieve with the BBC micro:bit project. Students and teachers (and home users) alike are sure to find them a fantastic starting point for projects based around the BBB micro:bit. Clearly to use these files you will need some CAD software. Autodesk provide their professional software free of charge to Education and Home user which makes it an ideal choice. You can get a number of Autodesk software products for free, for both educational institutions and home use, check here for more information. We’re using this design to create a few resources which we thought you’d find useful. Having the BBC micro:bit as a CAD object is incredibly useful when creating 3D printable (or laser cut-able) case designs. It means you can create your design with the knowledge that when you come to manufacturer the final design the BBC micro:bit should fit perfectly! An example use of this would be when designing a case, like this one designed by Chris Elsworthy from CEL Robox to create this great 3D printed case design. .iam file (AutoDesk Inventor Professional – Zipped). .stl file (Outside shell only – For 3D Printing – Zipped). .sat file (3D ACIS Modeler – Zipped). You can see the full BBC micro:bit – Kitronik University Course here. ©Kitronik Ltd – You may print this page & link to it, but must not copy the page or part thereof without Kitronik’s prior written consent. Welcome to the Robox newsletter! Communication has always been important to us at Robox HQ, but it’s easy to get wrapped up with in-house developments and forget to tell everyone what we’ve been working on. So from this point forward we’ll be making the effort to communicate with you on a monthly basis about our hardware and software developments, company changes or progress, what’s in the news, staffing updates and so on. A couple of weeks ago we reported on the delay of the dual material head, as we want to be completely transparent about how things are developing. The response from our resellers and end users was overwhelming positive, with most happy to wait for a reliable and tested design. Progress since this point has been good, tooling for the dual material reel holders is about to start after several rounds of prototypes (which were printed on the Robox of course!). We have received the first samples of the X-carriage cable and Bowden tube management system. This will improve bed homing and stop larger prints from interfering with the cables. This is especially important as we move to dual material printing as the weight and force that the Bowden tubes apply to the x-carriage may affect the sensitivity of the bed probing. So far things are looking good and tests are well underway. The design for the Dual Material Head has been approved with both the factory and the designers and a larger sample set is now being made. The manufacturing of these samples will test the new assembly and ensure that the assembly is easy and will be consistent. These heads will then be divided to do a range of tests, including life, functionality, quality of printing and performance testing, and some of them will add in the development of the software. Design work has started on a Drag Knife Cutter and plotter pen holder; these are just being finalised before we start preliminary testing. The extruder has been improved and we have added an additional internal part that allows the printing of flexible materials – early testing is extremely positive and the ability to print flexible parts will expand the possibilities for Robox even further. These changes are relatively minor and upgrade parts will be made available for users to buy and upgrade their extruders, we will also offer an upgrade service as I expect will our affiliated resellers. We’ve been working hard to incorporate the new features required for dual-material printing. The post-processor has been completely re-written to improve speed, quality and to integrate new dual-material features. You’ll be able to choose which material is used for support or which colour to use for each component. Grouping of objects is being added so that composite dual material objects can be constructed from ordinary single material models. Dual material mode is of course automatically available when a second extruder and dual material head are present. We’ve also introduced the first set of UI changes that will simplify and enhance print progress information and have made many small modifications based on suggestions from our users. 1.02.00 is going to be a great upgrade that we’re sure you’ll enjoy. We are delighted to welcome Le Comptoir 3D on board as a registered Affiliated Reseller for CEL Robox in France – visit http://www.lecomptoir3d.com/ for more details. Last month has seen significant coverage appear across 11 international news sites, from the likes of 3DPrint.com, Tech Digest, 3DPrintNews, Microfabricator, Shiny Shiny and 3DPrintingIndustry. Our biggest news stories focussed on Robox inventor Chris Elsworthy and his struggle with dyslexia growing up, and how he sees 3D printing as another way to showcase the creative talents of dyslexic children. We also had great success with our ‘Dad Bod’ story – one of our incredibly talented service technicians designed an up-to-date version of the David’s Michelangelo by giving him a ‘dad bod’ – a nice balance between a beer gut and working out. We’re tryng to supply our resellers and customers with as much information as possible for the Robox, so have introduced a new video which highlights some of the product’s key USPs, such as the unique HeadLock™ system, AutoMaker™ software, bed-levelling technology, and so on. Each month we’ll be introducing you to a member of the CEL Technology team – we’re keen for you to get to know us, and feel it’s important that we work together to take the Robox project forwards. This month we’re featuring TWO key members of the team – TWO because it’s hard to talk about one without the other, as together they founded the CEL name and launched the Robox 3D printer. Introducing our very own COO Kenneth Tam, who heads up operations in Hong Kong and China, and oversees all internationals sales, and CEO Chris Elsworthy, who heads up operations in the UK and oversees all design and production of the 3D printer and associated products. Kenneth and Chris have been business partners for 8 years, after first joining forces to launch the successful POWER8workshop. Prior to forming CEL the pair had been business acquaintances for a number of years while working for other companies, before a taxi ride together led to Chris sharing his design ideas with Kenneth, who, as an experienced businessman immediately recognised the potential. Further discussions led to a very firm friendship and trust in each other’s capabilities. Kenneth’s background is in marketing, manufacturing, sales and distribution, while Chris is an inventor and design engineer by trade. Since partnering, the pair have gone on to sell power tools internationally, win awards for their innovation, appear on television shows, and are now trying to secure their place within the 3D printing industry. Each has a passion for creating innovative items which are fun to use and fulfil a gap in the market. As we’re in for an inundation of ticks this summer, we here at CEL have designed this handy tick twist too. So if you find a Tick on yourself, a family member or a beloved pet, you no longer have to put up with a tacky supermarket tick remover or wait days for amazon shipping. Just print this handy Tick twist tool and get it out asap! It is very important that the first layer is printed at 0.1mm (100micon) or less. The tick’s body must not be compressed, as this can force out saliva and gut contents which may contain disease-causing organisms. The tick should not be irritated or injured, as this may result in it regurgitating (vomiting) saliva and gut contents along with any disease-causing organisms. The mouth parts of the tick should be cleanly removed along with the rest of its body. The tick should be removed without causing the host discomfort. When removing the Tick, wear rubber or plastic gloves.